In general, with tomatoes and most other edibles, you want to water the soil, not the plant. “You’re also supposed to do it in the morning,” Pierson says, because that allows any leaves that do get wet to dry in the sun during the day, but not all of us have time to get the watering done in the morning so, if need be, do your watering later in the day, being careful to keep the foliage as dry as possible. “If you have drip irrigation, do not run it all day, every day,” Pierson says. The flavor of tomatoes is vastly improved by letting the soil dry out a bit. If you keep the hose going, “you’ll have water bombs instead,” Pierson says. “A little bit of flagging in the plants is OK. They get a silvery color, and they start to droop just a little bit.” That’s when you water. This is what good tomato hygiene looks like. The base of the stem is free of leaves and suckers. 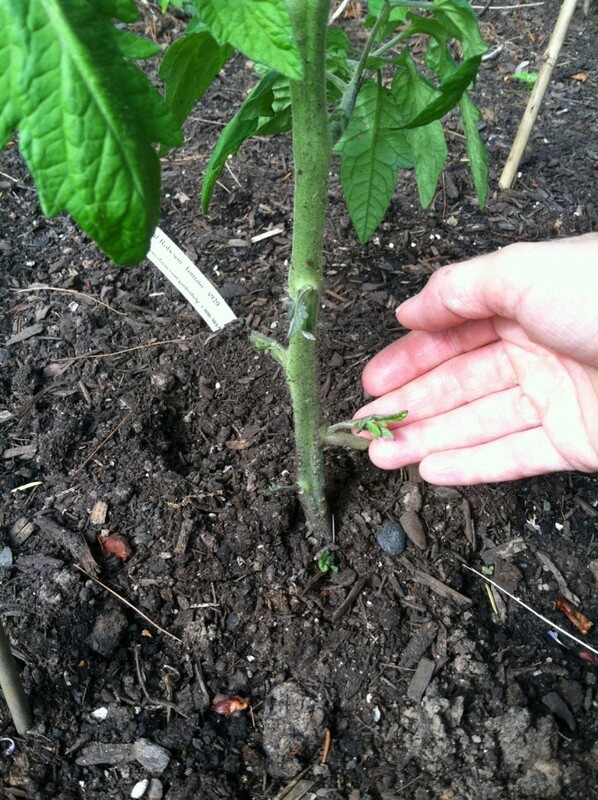 The important thing, Pierson says, is to practice good tomato hygiene, removing leaves that are touching the ground to prevent soil from splashing up onto the foliage and possibly conveying diseases. This is particularly important if you’ve had disease problems in the past, she says. As you snip off leaves, be careful to leave a stub of about ½”. 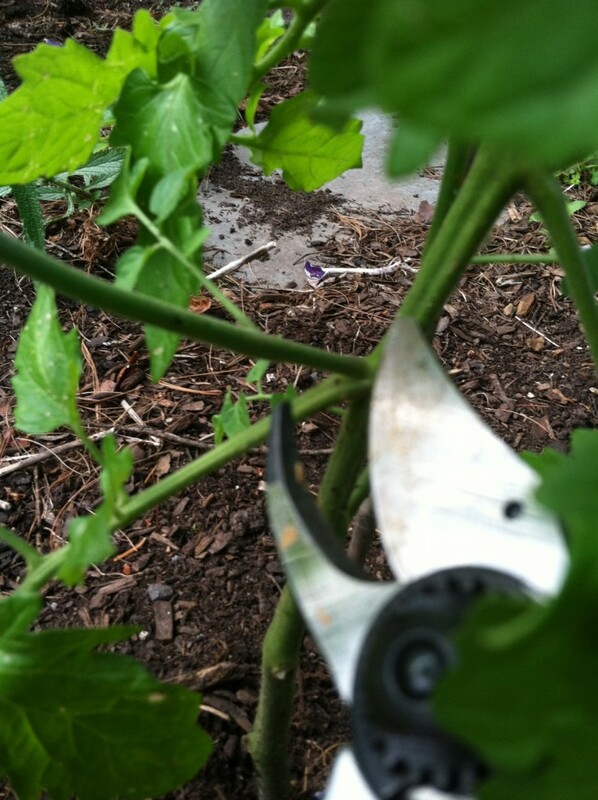 This prevents cutting into the main stem, which is something that hurts the plant and can open it, literally, to problems. Pinching away foliage — especially leaves and suckers that are close to the ground. Higher up on the plants, “you can thin the plant for better air circulation, which helps with fungal problems,” Pierson says. “Cut some leaves and non-fruiting branches.” If it’s a rainy summer, the need to promote air circulation is particularly important. 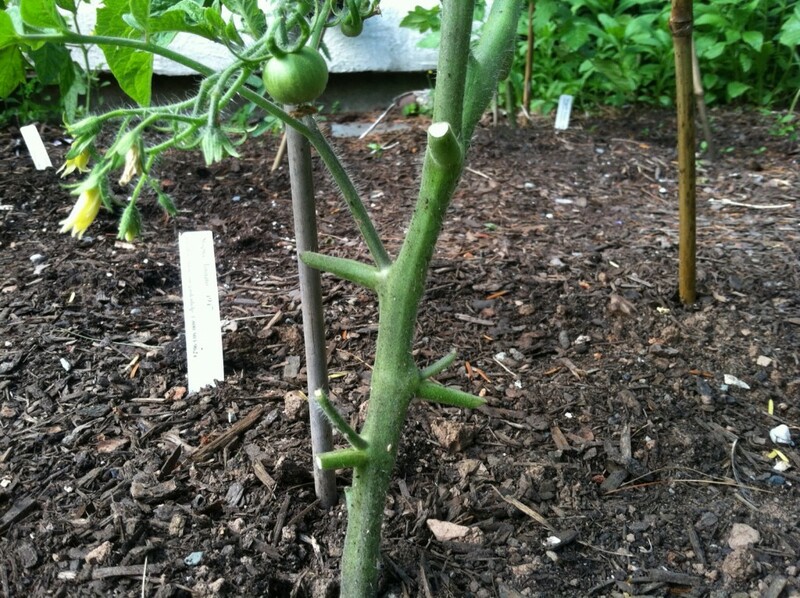 Pierson occasionally prunes to control the size of indeterminate tomato plants (the varieties that tend to sprawl all over the place). “When your ‘Sungold’ is 8 feet tall, you’re going to lop it,” she says. “For purposes of supporting the plant, you might also prune it.” But topping a tomato plant may mean you’ll lose some fruit, so think twice before you make a cut. “Any time you prune the plant, you’re possibly reducing production,” she says. If you’ve amended your soil properly before planting, feeding your plants with fertilizer is optional. “The compost is doing most of the work,” Pierson says. In areas of the country with a short growing season, this is especially important. Choosing which fertilizer to use depends on your preferences and your growing conditions. Pierson has always relied on White Flower Farm’s All-Bloom Fertilizer, a 15-30-15 formula that’s high in phosphorus for root growth, and micronutrients. One of the bonuses is it won’t attract critters the way fertilizers that smell like fish sometimes do. 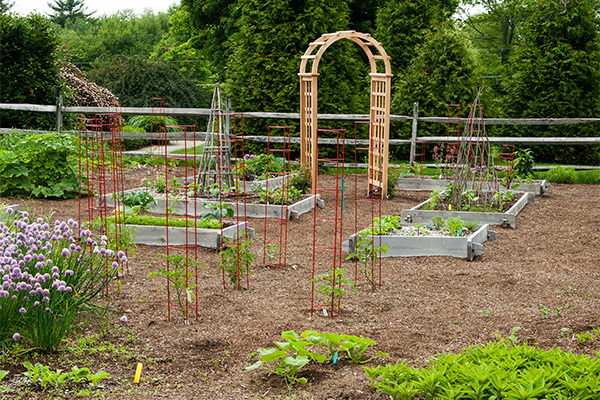 The key here is trial and error to see what works best in your garden. Fertilizer helps promote “more fruit set and earlier fruit set,” Pierson says. Pierson lets tomato plants grow in the ground or in container pots for approximately 3 weeks before feeding them for the first time. Then she’ll feed roughly 2 to 3 more times before the plant is actually producing. “When the plant sets its fruit, back off feeding,” she says. “Back off water and back off feeding once the plant is covered in fruit. Too much water, and your cherry tomatoes will be cracking.” Excess water also invites diseases. 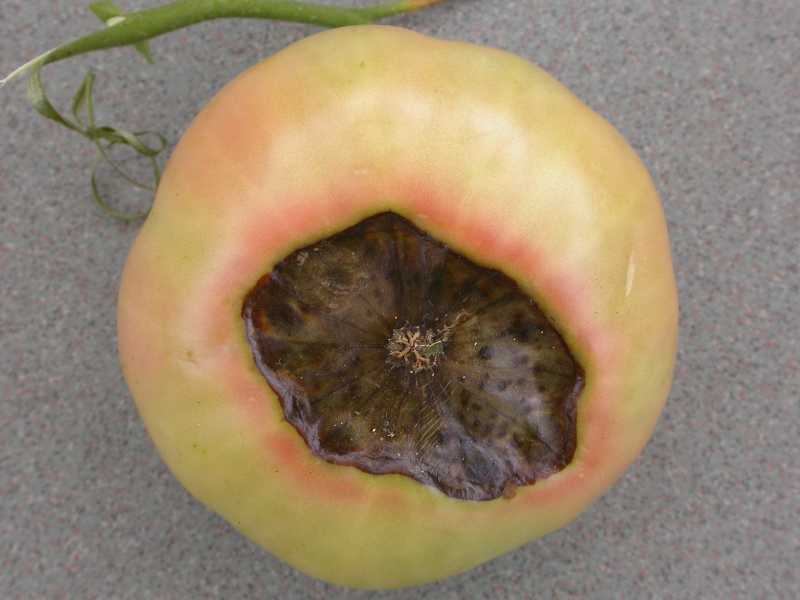 Septoria Leaf Spot of Tomato. Photo courtesy of Missouri Botanical Garden. 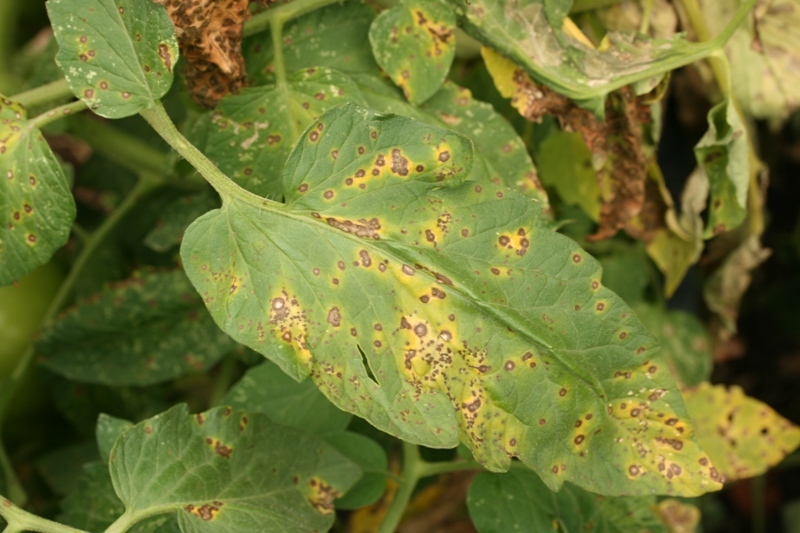 A fungus that manifests itself as brown spots on leaves, Septoria is one of the most common conditions that can afflict tomato plants. It begins on the lower leaves and spreads upward. “If you’ve had septoria in the past, when the plant gets to be 24” tall, remove all foliage that’s touching the ground,” Pierson says. This prevents soil from splashing up onto the leaves and possibly introducing diseases. For more detailed information, visit the excellent Missouri Botanical Garden website here. Other problems, including the moisture level of the soil and improper or excessive fertilization, also may cause blossom end rot. 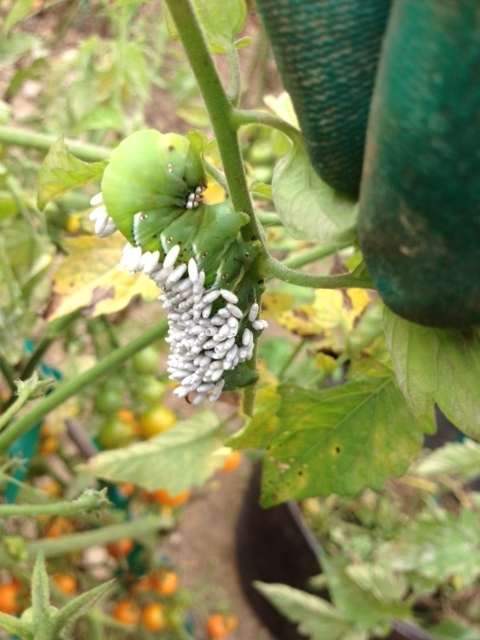 Hornworm covered in the cocoons of a parasitical wasp. Photo by Barb Pierson. “If you see a branch with no leaves, it’s probably hornworms,” Pierson says. The bright green, chubby insects are sometimes hard to spot because they blend in so well with tomato stems and foliage, but the worms have diagonal white stripes on their sides and a spiked horn near their tail ends (hence the name). To rid tomato, eggplant, and pepper plants of these foragers, “just pick them off,” Pierson says. You don’t want to spray or use chemicals because you’ll be eating food from these plants. If you see a hornworm covered in what appear to be tiny white specks, those are the white cocoons of the parasitic braconid wasp, which eventually kill their host. A host of plants, from Phlox to Lilac, are susceptible to powdery mildew. Squash is another. Pierson recommends the “old-time” milk treatment, which involves diluting 1 part milk (any type from whole to skim) in 2–3 parts water and spraying it on the plant until the leaves are dripping. “It changes the pH of the leaf so it’s not as favorable for the powdery mildew to spread. Do it preventatively and then once per week. Reapply after it rains.” Pierson confesses that she doesn’t bother with the milk treatment because the squash fruits are fine regardless of the mildew. The milk treatment “comes under the heading ‘Too Much Work,’” she laughs. Squash vine borer. Photo courtesy of Missouri Botanical Garden. 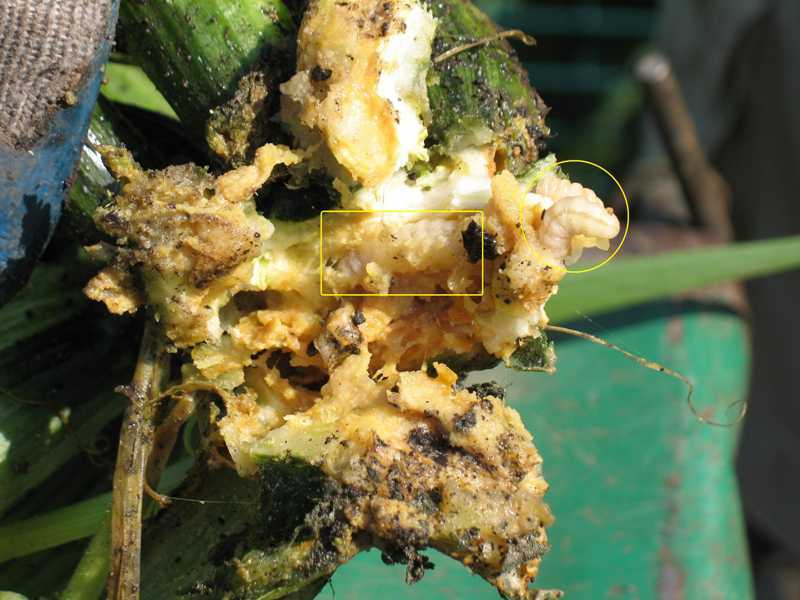 Squash borers are another story. “The borers will work their way into stems and small fruits, and start to grow. The squash turns brownish, and it will fall off and die,” Pierson says. The remedy? While there are a few measures that can be taken to stop the borers, most are tedious and time-consuming. Barring the use of chemicals on your edibles, you might prefer to pull the plants, disposing of them completely (do not compost) and leaving the soil open to birds who will help clean it. Eggplant and Peppers require little maintenance, perhaps just some staking as their branches, laded with fruit, get heavy. One tip for next year: both eggplant and peppers “love to be planted in the collapsible potato bags,” Pierson says. The black bags get warm in the sun, making the soil warmer than it is in most garden beds. “They like hot roots,” she says.